After returning from our Christmas travels I have been so busy with work and teaching that I've been on a bit of a kitchen hiatus, making the minimum to get by, or asking Chris to cook. But this morning I woke up late, rested, and ready for some recreational baking! I like to make breakfast treats on Saturday morning for Chris and I, its our time to come together again after our busy weeks. 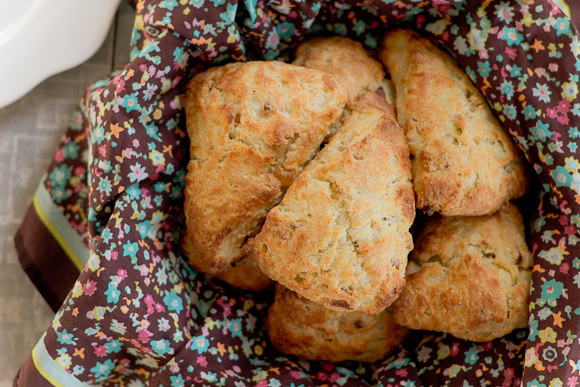 I make scones about once a month, gradually perfecting my dough recipe and experimenting with different add-ins. Preheat over to 400F. In a large bowl, whisk together flour, sugar, baking powder and salt. Slice the butter (be sure its cold!) into pieces and drop it into the flour mixture. Pastry blender and metal bowl inherited from my grandmother's kitchen. 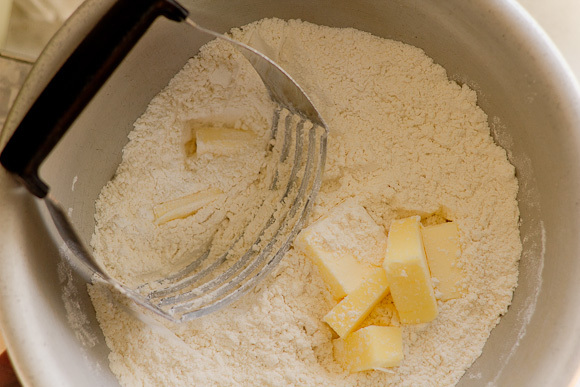 Cut the butter into the flour with a pastry blender or a fork, tossing butter in the flour as you work, until mixture is crumbly and butter pieces are no larger than the size of a pea. Toss the chopped ginger and apricots with the mixture, separating any pieces that stick together. 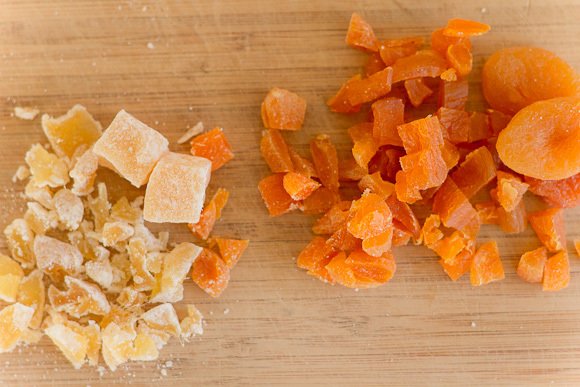 Crystallized ginger and dried apricots on the chopping block. In a small bowl, whisk together buttermilk and egg, then add all at once to the flour mixture. Mix with a wooden spoon just until dry ingredients are moistened. Using your hands, knead the dough on the sides of the bowl until it forms a somewhat sticky ball. On a floured surface, pat the ball into a circle about 8-inches around, and slice into 8 wedges with a pizza cutter. Place the wedges on a baking sheet, at least 1-inch apart and brush tops with milk. Bake for 12-15 minutes, or until tops are golden. Serve warm with butter and/or jam. *Homemade buttermilk tip courtesy of Martha Stewart: I rarely have buttermilk on hand, so I make my own by mixing 1 1/2 tsp white vinegar or lemon juice with 1/2 cup of milk. Let sit for 30 minutes before using. We enjoyed these at our kitchen table this morning with some strawberry jam and a pot of green tea. Can you send me some scones dear?